This is a salad and sauce in one, and probably the easiest way to cook salmon ever. Massaging the salad in a bag re-creates the Thai technique of lightly pounding the vegetables in a large mortar. Even better, you can make the salad in the bag ahead of time and keep it in the fridge. Heat your oven to 200°C. 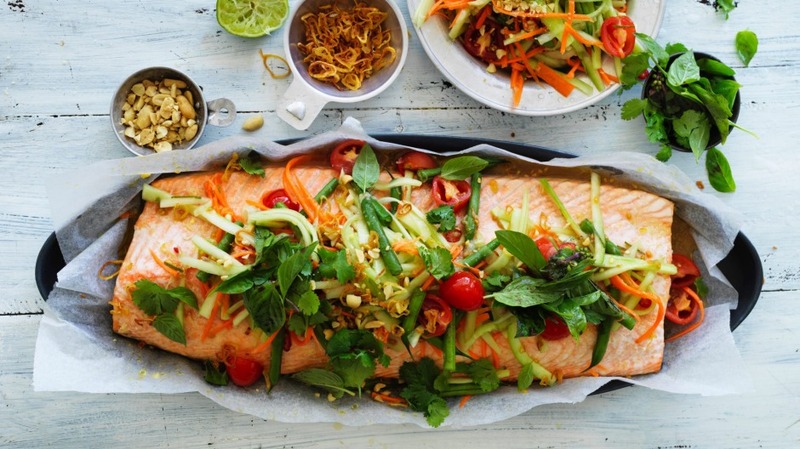 Place the salmon skin-side down on a piece of baking paper on a baking sheet. Drizzle with the olive oil, season with salt and bake for about 15 minutes, until the salmon is just cooked through. For the som tam, combine the garlic, chilli, lime juice, sugar and fish sauce and stir to dissolve the sugar. Taste the dressing and adjust for seasoning. Place the cucumber, carrot, beans, tomatoes and lime leaves in a large press-seal bag and add the dressing. Squeeze as much air out of the bag as possible and seal tightly. Massage the bag strongly with your hands for a few minutes to crush the vegetables, release their juices, and mix them with the dressing. Remove the salmon from the oven and pour the contents of the bag over the top of the fish. Scatter with the peanuts, fried shallots and herbs. Adam's tip A whole side of salmon looks very impressive when you're serving it, but it's very easy to cook. Just make sure to take out the pinbones with a pair of tweezers (or ask your fishmonger to do it). You don't even need to scale it. Just let the oven do all the work. Also try: Adam Liaw's taco dogs.